Plants, fertilizer and other supplies* will be shipped at the proper planting time for your area of the country during the shipping timeframes outlined below. Shipping for most items begins in early September, when the weather is cooler and your plants have the best chance for success. We do have a selection of established plants available for shipment in the summer. For information on what to do when your plants arrive, see our planting guide here. 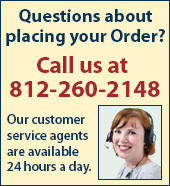 In all cases, we choose the fastest, most efficient way to send your order. Our shipping rates are calculated based on our average shipping costs per order. These charges simply cover the processes we have in place to ensure the safety and health of your order as it goes through the postal system.